My three month bicycle tour of New Zealand and other adventures. I'm running out of time. I knew I wouldn't be able to do all of the north island but I am only now coming to accept how little I am able to do. 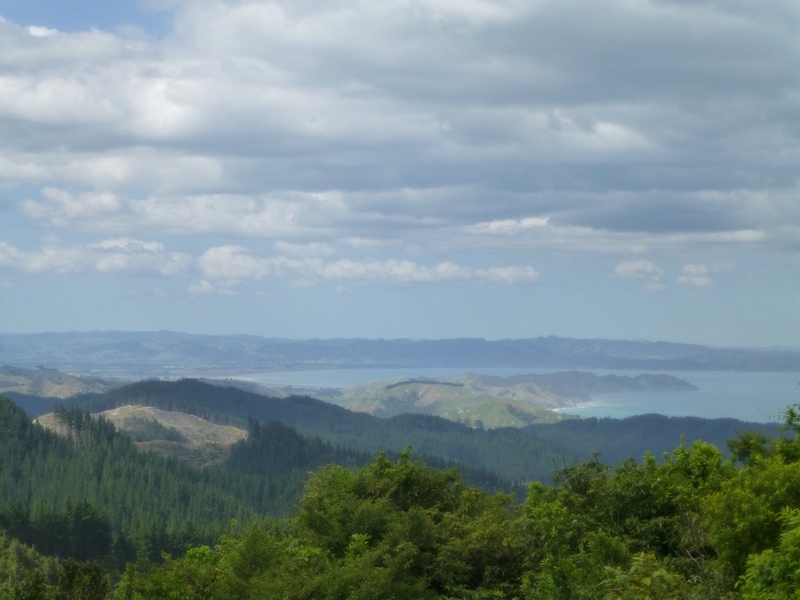 A while back I plotted out my goal for the north island, a dash to the top (Cape Reinga) then back to Auckland. Of course, I never follow any plan that I make ahead of time here. It really is a good way to tour, have a vague idea of what you might do, but ask everyone you see what you should do and find a better plan. The straight shot skipped the east cape area (cutting direct from Gisborne to Tauranga) and did not do the peninsula. 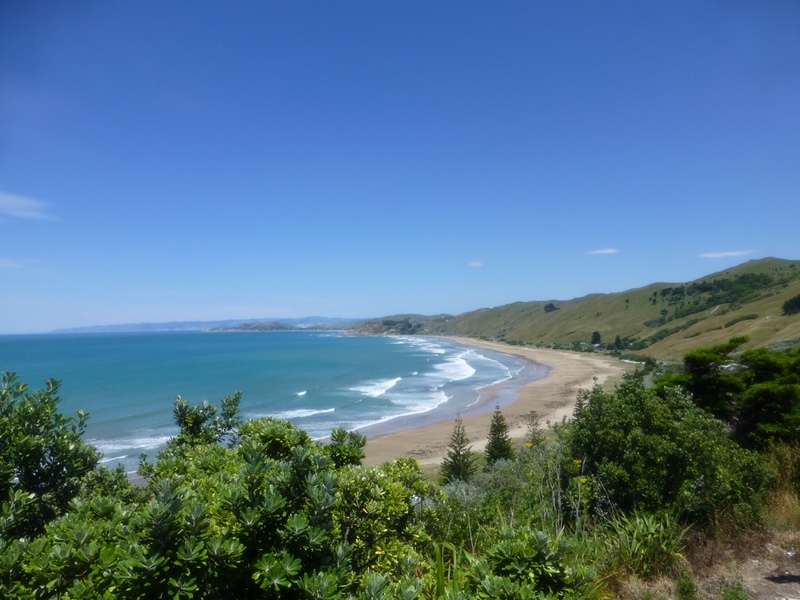 Well I spent a week slowly bouncing from bay to beach along the east cape and am set on strolling up the Coromandel Peninsula as well so I had to skip Lake Taupo (set next to “Mount Doom”) and Rororua (geothermal area of interest that apparently smells foul). I also had to skip Hobbiton, which is something everyone from home seemed to think would be a requirement while here. It was still in my plan to make it to Cape Reinga though. They may be small islands but there is so much to see I could probably spend years here just exploring. I set out to make it to Tauranga, a port city. My great luck with the weather finally left me. I fought an annoying crosswind most of the day. Perhaps it was weaker than what I often had on the South Island or I'm getting stronger (though my legs feel like mush currently) as I was keeping a pace of around ~15kmh as opposed to the 10kmh I would have during South Island heavy winds. If the winds weren't enough, dark storm clouds moved in and I spent a while getting rained on. I'm actually not able to remember the last day it rained steadily during my riding. Surely hasn't been since early on the north island or maybe even further back than that. No complaints there! Tauranga is big enough to have a YHA, so I took advantage of the cyclist discount and got myself a bed. A good decision too, it stormed pretty hard overnight and the winds were pretty loud even inside. I've been getting pretty used to figuring out which road, as there is usually only one, is going to take me to my desired destination. So, silly me, didn't read Pedallers' Paradise before leaving. 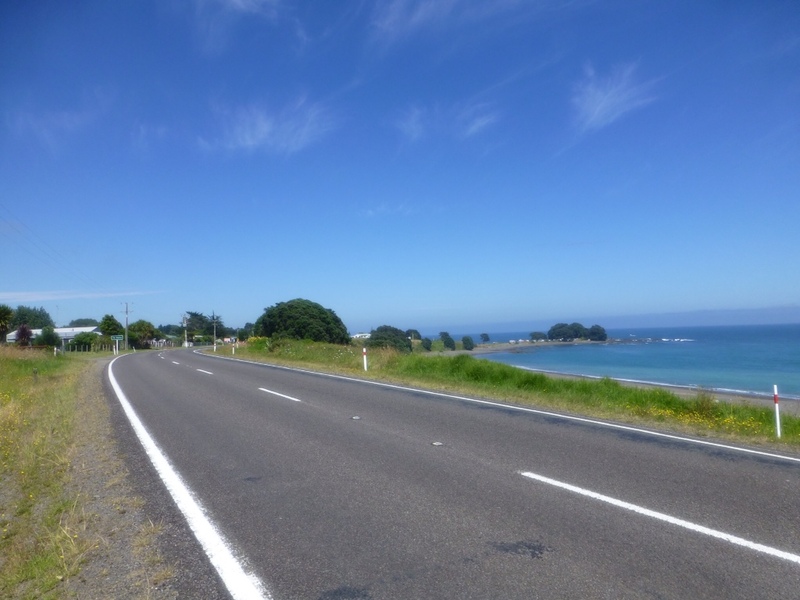 I left Tauranga riding State Highway 2 all the way to Waihi. The guide had this to say about that segment. 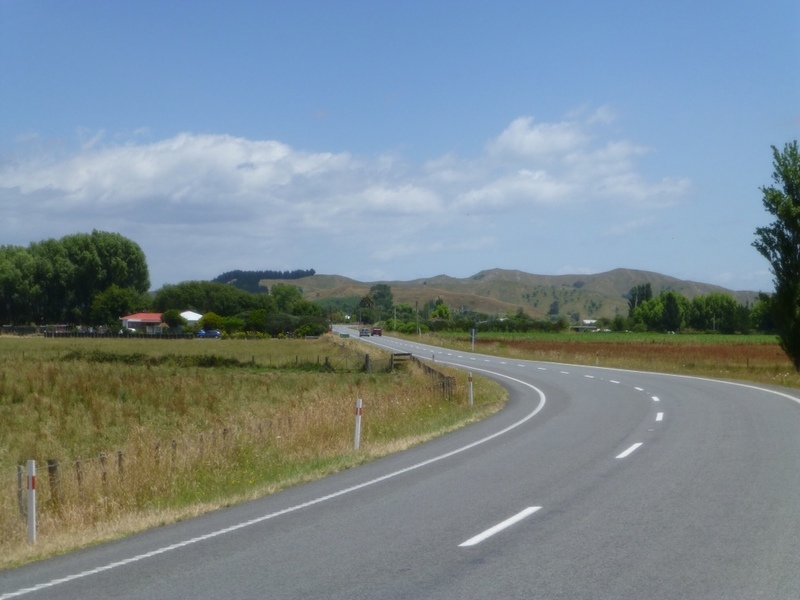 Note: SH 2 between Waihi & Tauranga has a reputation for heavy and sometimes dangerous traffic and is called “Suicide Highway” by some! Now, given I did not see this coming, I make the right turn leaving town on the roundabout and am plunged into what most closely resembles an interstate highway in the states. Oooooohhh boy. I can't shake the feeling I'm really, really not supposed to be here. I'm pedaling along 17kmh against the headwind still present on the side of the shoulder as a few lanes of cars barrel by me. I see the occasional bicycling related sign which continues to reassure me I'm not doing anything wrong. Well, legally wrong, I still don't want to be here. I didn't stop to take a picture because I didn't think anything good could come of lingering on the shoulder of this road. 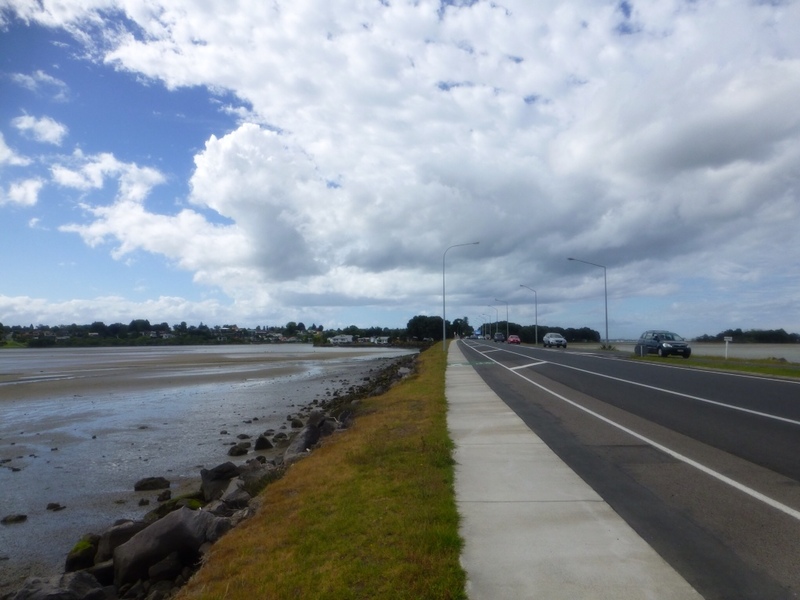 The further I get from Tauranga the more the road calms down. The cement wall divided highway with on/off ramps gives way to a normal double lane highway, then two lanes each way drops down to one. The shoulder remains for the vast majority of the ride (and for this I was so grateful). Despite heavy traffic, my slow legs and my dipping in and out of traffic for every bridge or occasional narrowing of the shoulder, people were rather courteous. I was honked at twice in my 65km time on the road. Once while I was about 6 feet from the road in a huge shoulder and once by a guy who didn't think he should have to use the passing lane to pass me. I waved and eventually he found the other lane. 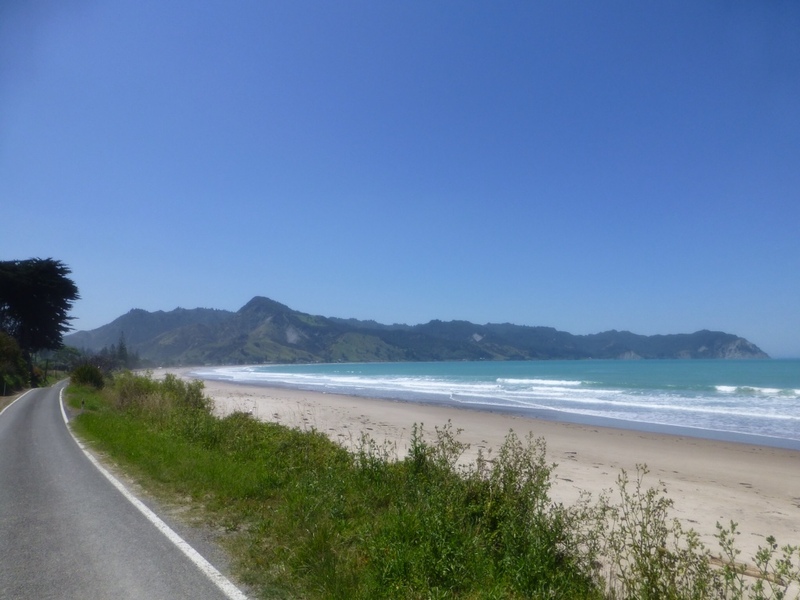 I had wanted to get to Whangamata, 36km into the peninsula but between stress of the crazy road and being tired from another day of head winds and 700m climbing, I called it a day at Waihi. It was an okay day I suppose but it left me seriously missing the peacefulness of riding in the South Island. It also left me wary about my trip going north of Auckland, as I know those roads are going to be heavy traffic as well. This entry was posted in Uncategorized on January 16, 2013 by twymer12. After drinking some last night I didn't quite get enough sleep. I didn't feel bad at all this morning, just tired. Figured I'd take a lighter day due to that and the gloomy weather and only ride to Whakatane (pronounced f*** uh tah knee). That provided a lot of confusion when I was trying to figure out what city people were talking about.. I'm glad my last two days were during the weekend because apparently I'm in the line of fire of logging trucks now. 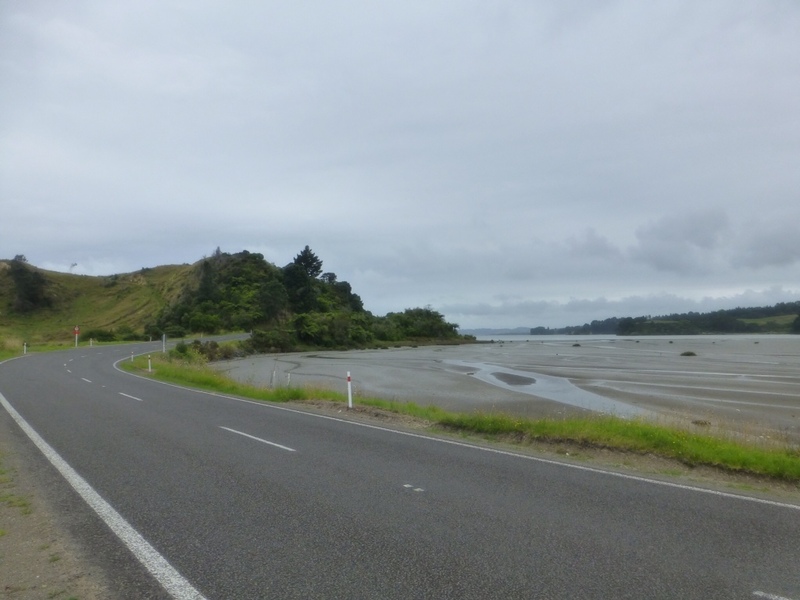 Had about a dozen pass me in the 10km I spent on the main highway before I got off for a shorter scenic route via Ohope to Whakatane. The weather was gloomy but I enjoyed a cool day with no heat from the sun. 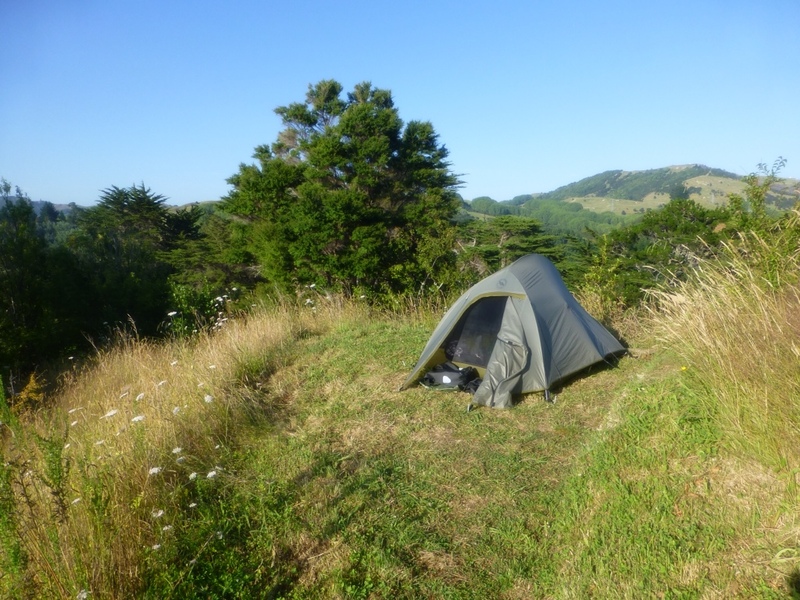 Found that it was another $20 camp in Whakatane so strolled around the backpackers like last night and found one that does tent sites for $14. I really like tenting at backpackers. It's usually cheaper than motorcamps and I get the social aspects and nice kitchen/public area of a hostel. 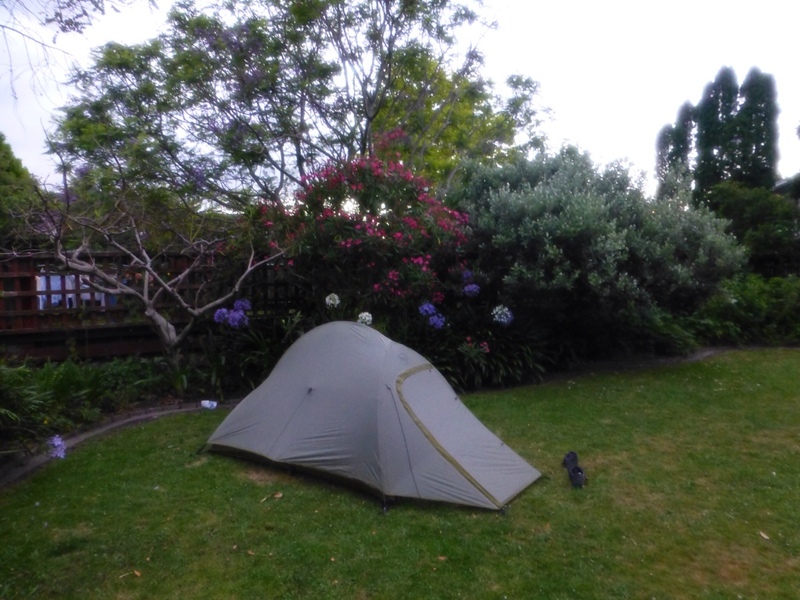 The tent sites are often in a garden with only enough space for 1-4 tents so it tends to feel pretty cozy. I spent my night talking to an Irish guy here traveling and working on planes named Paul. He seemed to know the north island in and out and gave me tons of tips on where to stay and all kinds of cool stuff to do on my route. Unfortunately given my short time frame I can't do much of that but oh well. This entry was posted in Uncategorized on January 14, 2013 by twymer12. Day 73 – No shoes, no problem! I set out from Whanarua Bay with no real plan of how far I'd go. I have been avoiding set hopes and plans as I tend to have no clue how my legs are going to handle a day. As I mentioned before the hills, though smaller on average, are often extremely steep and can be pretty exhausting. Again the day cut in and out of the coast with the same beautiful weather I've had all week. I was glad to see some clouds though, which gave occasional relief from the heat of the sun. I passed camp site after camp site as I was feeling pretty good and enjoying the day. 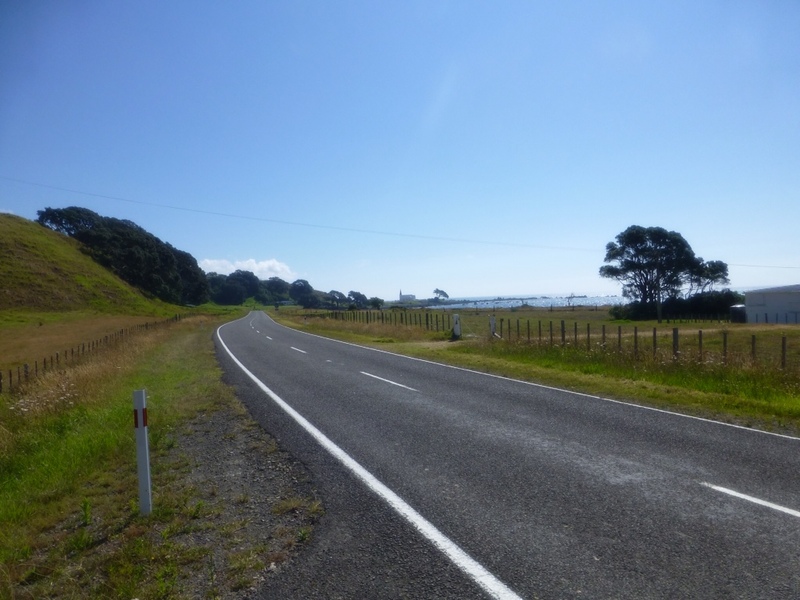 I make it over Maraenui Hill and decide to skip the Hawaii Bay and head the remainder of the way to Opotiki, a small city. When I get to town I realize the motorcamp there is $20 and I'm not willing to fork that out so I try roaming around for backpackers. I discover Central Oasis Backpackers which seems pretty nice and only charges $12 to pitch a tent so I'm sold. It's pretty packed with working holiday kids and as it was Saturday night most of them were ready to drink. I was enjoying hanging out with them so this was fine with me. A New Zealand thing that I haven't talked about before is the fact that shoes are pretty much optional here. Most establishments have signs about leaving dirty work boots outside so it's common to see people kick off their boots and go in socks but its also common to see people on the streets or in stores completely barefoot. I mention this because they were heading to get more beer and I decided to join but could not find my shoes and was quite excited to finally take advantage of this shoes-optional policy and hopped in the car without. Felt strange walking around a supermarket barefoot, though. So I had some beers as they worked to cook the mussels they caught that day in various fashions. Had Belgian style, more normal cooked versions and even mussel patties. This was the first time I've tried mussels, I enjoyed the taste but not the texture. The patties fixed the texture problem, though. College is something I spent a while wishing I could go back to, I usually feel when I'm at hostels full of working holiday travelers that this is the closest thing you can get to being in college again. You live in a dorm room, spend most of your time not at work watching tv or drinking and instead of complaining about class you complain about work. To top it off there's no homework this time! At this point I wouldn't really want to take one of the fruit picking jobs but pay seems descent, something like $15/hr. This entry was posted in Uncategorized on January 13, 2013 by twymer12. I woke up feeling the weight of this week in my legs. I've had a handful of days recently with 1km ascent and I haven't felt like my legs were in any way fresh since somewhere on the South Island. But on I ride because I can still turn the pedals, because I still have things to see and I'm running out of time and what else am I going to do? It really does not help that I woke up and am immediately faced with a 240m climb in about 2.5km. I knew it was there so I stretched and spun lightly around the camp ground hoping to be a little ready. I gritted my teeth and watched my Garmin say 10% grade for oh too long. Leaving camp starts to take me inland so the view from my climb (picture below is about half way up) is the last of the sea I will see for a bit. After this I drop down to Hick's Bay and the hills are no longer as tall but still just as steep. A head wind picks up somewhere around here and I'm finding I can't get my bike up 14% grades while fighting a wind so I am glad I can walk in these shoes. After fighting wind and steep hills through inland farm country for 50km I'm feeling a little down on my luck. But finally, I make it back to the coast. I stop to catch my breath and stare at the sea and run into another cyclist going the opposite direction. Good to see I'm not the only one out suffering on these hills. There are far fewer touring cyclists here than on the South Island so sometimes I wonder. From here, the road hugs the coast for the next 200km and the views are fantastic. I am completely blown away by how phenomenal this area is. No traffic, absolutely beautiful weather and constant view of the sea. It may even be worth the week of hills. The wind has died down and I'm pretty pumped about the scenery so I find some sort of second wind and keep pedaling. 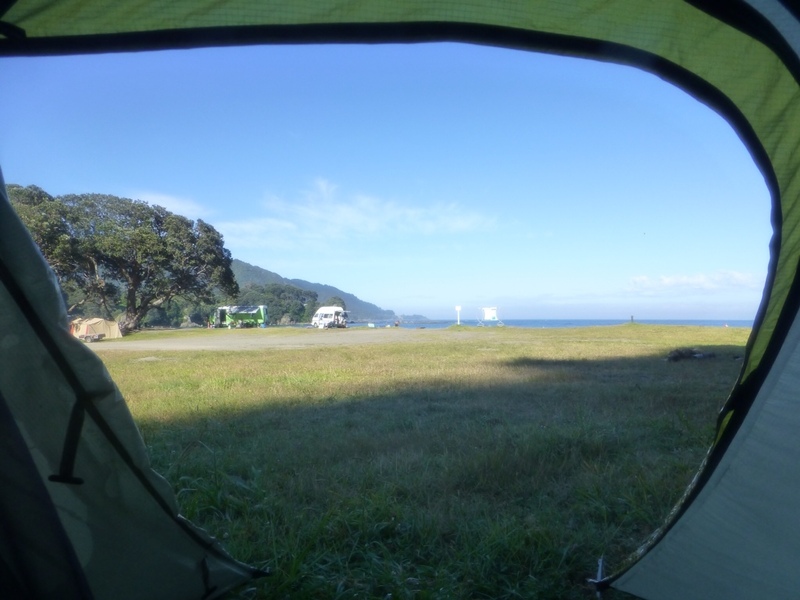 I make it to Whanarua Bay and that energy is gone, so I pull in to the cheap beach camp to set up here. I find a quiet corner, reasonably shielded from wind and the morning sun next to two older couples encampment and pitch tent. I'm famished at this point so before I even put things in my tent I walk to a cleared patch of grass to fire up my gas stove and make dinner. One of the ladies, Sue, saw me and asked if I wanted to join them for dinner. I was kinda caught off guard, I figured they meant bring my food and eat with them but I hadn't even started. She asked what I was eating, beans, rice and Moroccan tomatoes I said, then she offered lamb roast instead. I join her and her husband Richard as well as their friends Teresa and Doogle for a delicious top notch camp dinner of roast lamb, assorted veggies, wine and beer. There was even blueberry pie for desert. I share stories of my travels and we talk until its completely dark out. As I mentioned before I haven't unpacked anything but my tent so when we split for bed I had to try to set up by my flashlight until the batteries died. Perhaps I should have bought spares when the warning started, oops. So the day started off with me suffering and being tired and ended in a beautiful coastal ride topped with a fantastic dinner with new friends from the other side of the world. So that's why I tour. Some days I suffer a little and some days maybe I suffer a lot but I'm out here traveling by the power of my legs, seeing new and beautiful places and meeting interesting people from around the world. This entry was posted in Uncategorized on January 12, 2013 by twymer12. Decided I would get an early start this morning so I woke up at 6:30 and started packing my stuff. I wanted to beat the heat today. 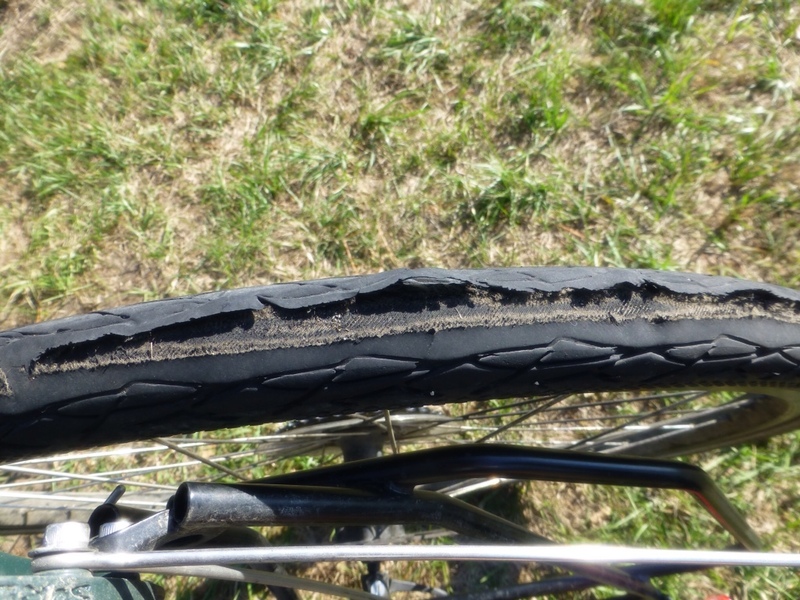 Well, when I was putting my rear panniers on I noticed my tire looked a little destroyed. This is the original rear tire (a Continental Comfort Contact) and has lasted me probably close to 2500 miles with time on rough pavement and gravel roads. Most importantly it did all of this carrying heavy weight and not once had a flat. So all things considered I was pretty happy with the tire. 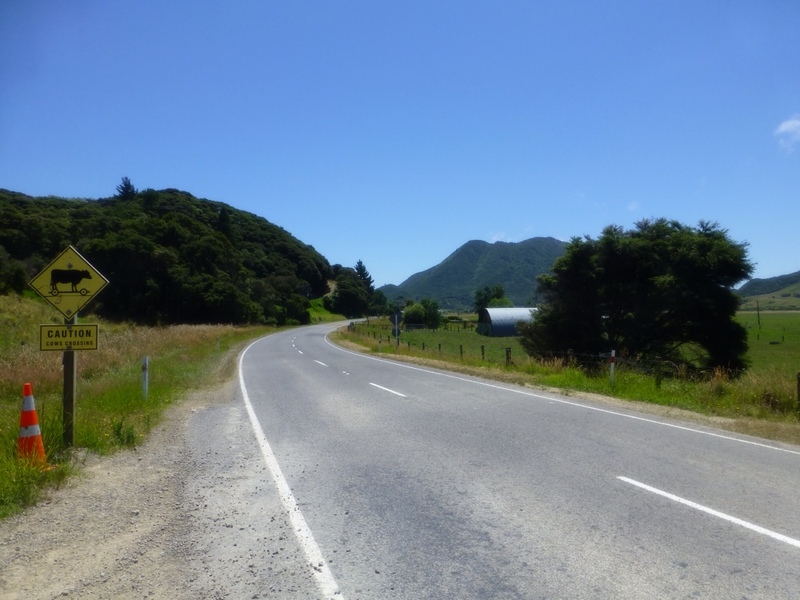 I wandered over and asked Rob what I might do about getting myself to Gisborne, since there was no bike shop in my direction for 300km or more. He told me to head to town and see if I could get one brought on the courier. I ride the 4km to town, tire still holding up, and ask at the dairy (the only thing open) about how to arrange a courier. They let me use their phone and help me call a pile of bike shops looking for someone who is willing to deal with me needing to pay by credit card over the phone. Nobody can do that, though, but Freddy from Bikeys bike shop was really helpful and wound up agreeing to send the tire on the courier cash on delivery. I had nagged him with several calls as I figured things out and they weren't even supposed to be open yet! Really appreciate him and the nice lady at the dairy for helping me get back on the road. 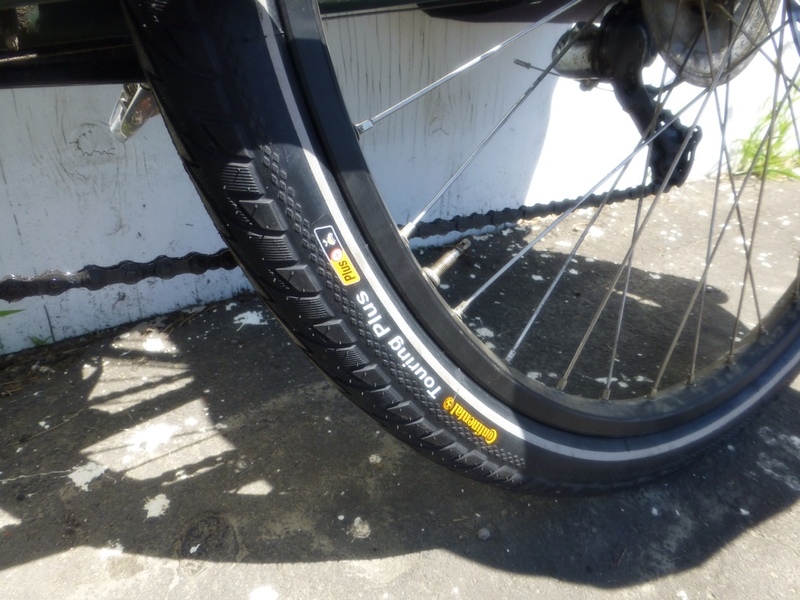 I upgraded the rear tire to a Continental Touring Plus, since it was that or a cheap tire. Unfortunately it was more than I wanted to spend but stuff like that isn't as cheap here as it would be back home. Cost me $10nzd as well to get the courier to bring the tire and return the cash, but it came by 11:30am and sure beat hitchhiking to Gisborne and back. Well I didn't beat the heat so when I finally got on the road it was up around 90 degrees and the tar on the road was melting. At some points it caused trucks to tear the road up and send stones flying but for the most part it just meant the road occasionally felt like glue. I made my couple climbs and wasn't feeling it. 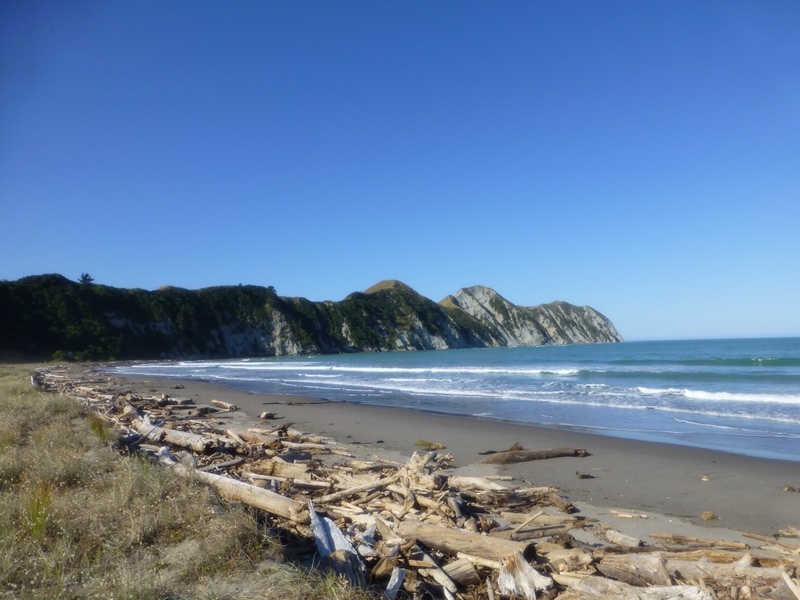 Between the heat and the steep hills I was exhausted by the time I made it to Tokomaru Bay. I stopped to eat a snack on the beach and ran into a German guy, Faulkner, who was sitting next to a Surly LHT. We talked for a while and he told me about the backpackers he was staying at (Brian's Place), said they had tent sites so I went up to check it out. From the hostel itself I had to climb stairs cut into the dirt up a hill to this single tent site area with the most spectacular view. So after seeing the spot I decided I would end my day here happily. This entry was posted in Uncategorized on January 10, 2013 by twymer12. It's definitely summer here now and the more north I go, the warmer it gets. This morning I was woken by a gap in the trees letting enough light hit my tent above my head to turn it into a stifling hot room. As soon as I unzipped the rainfly door the cold air rushed in and I was wide awake. I went into my hosts kitchen to make some coffee (I can't wait to not be drinking freeze dried coffee every morning) and some toast. From there I started heading up highway 35 into the cape. Beautiful beaches and bays kept appearing whenever the road turned back out towards the coast. Yesterday's marvelous tailwind had left me and now I was fighting a big of head/cross winds coming from over the sea. Not entirely unpleasant, given the cool air kept the sweltering heat of the day and sun a bit more manageable. Outside of the winds it was a day of constant small but steep hills. 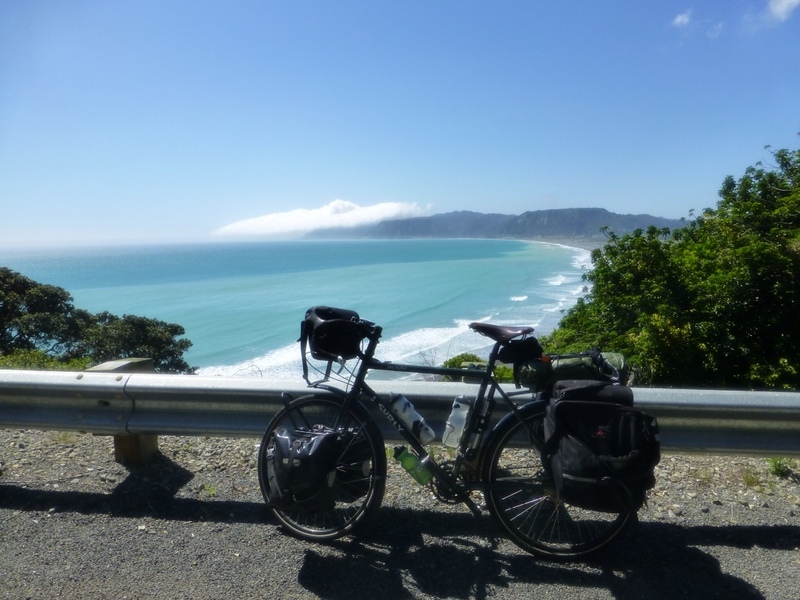 I decided to it quits about 55km in when I had made it to Tolaga bay. 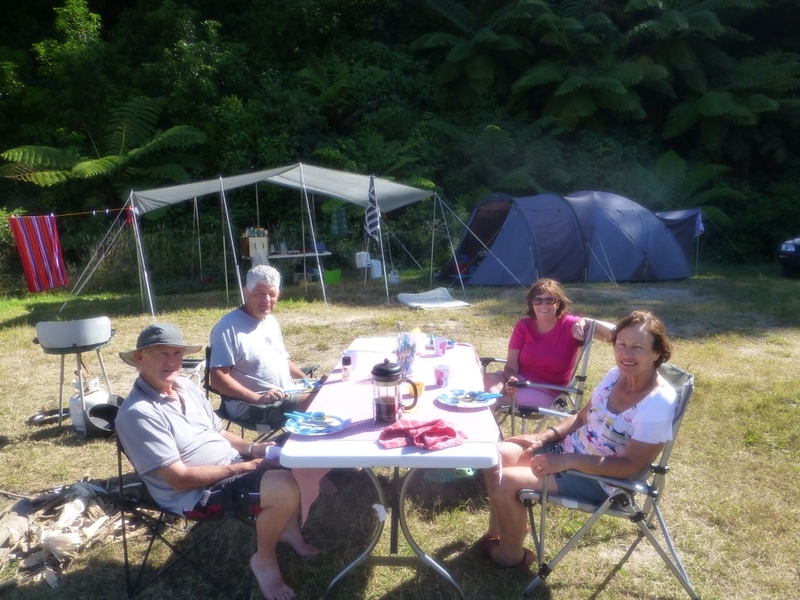 The east cape is full of “freedom camp” sites, including one here, but they have a strange definition of this as you must pay some money for a permit and follow the list of rules. The only rule that really didn't work for me was that you must carry a chemical toilet. I chose to ignore this rule and pitched tent by the beach near a public toilet. Some of the camp sites there were semipermanent structures that families have been using for years. Next to me was a Maori family with a giant festival tent type thing and inside they had everything, including the kitchen sink. Spent a while talking to Rob, who now lives in Thailand. It's interesting to hear the opinion people abroad have of the states. No shower here but splashing around in the sea made me smell a little better. I love this place! This entry was posted in Uncategorized on January 8, 2013 by twymer12. 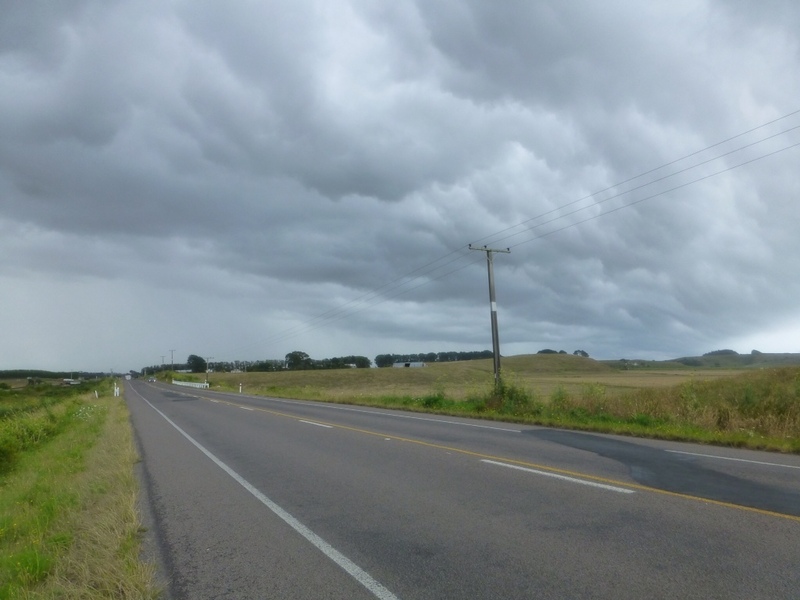 I left Wairoa heading to Gisborne, a 99km ride. Gisborne is a decent sized town and the start of the east cape area. It was a hot, tiring and beautiful day. The hilly nature of the past few days didn't stop today (nor will it any time soon). Though today most of the time spent suffering was on one big climb in the middle that turned into some weird stair-step like climb until I was left with a stunning view before the descent. Outside of the hard 25km in the middle, the rest was mostly flat and with a reasonable sized tail wind so I cranked an average speed of 19kmh, including the time spent eating lunch, snacks and occasionally resting my wimpy legs. That's ignoring the effect the hills in the middle had, though. 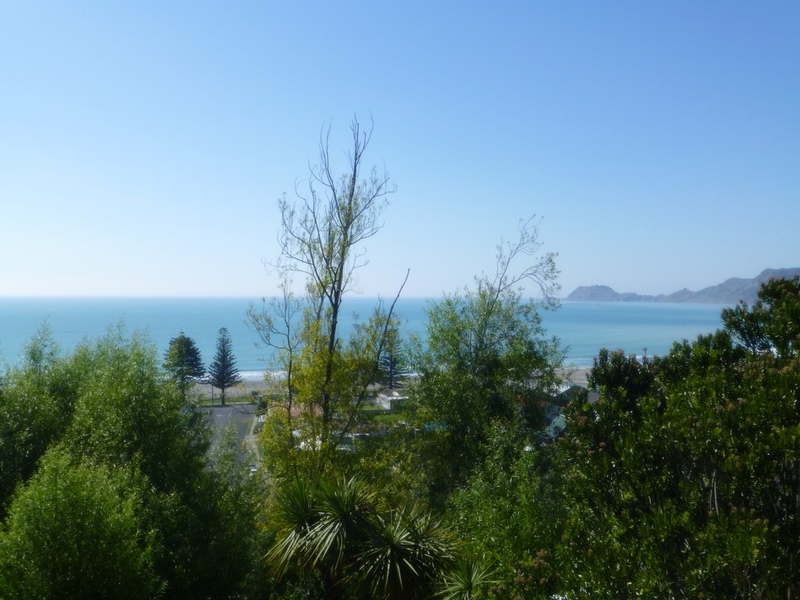 I was set on Gisborne today as I was staying with another warmshowers host, Eric and Laura. 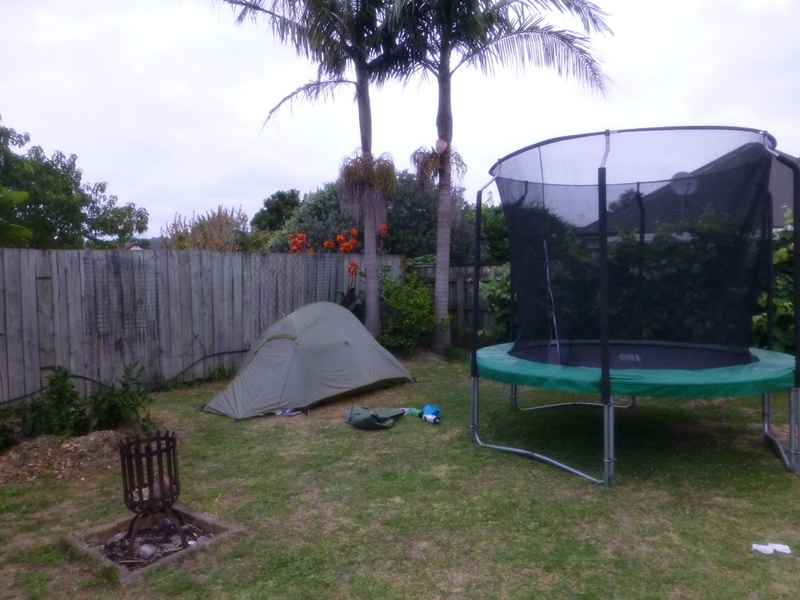 A bed may not have been waiting but a quiet and cozy spot for my tent in their back yard was great. I got my hot shower and discovered Eric and Laura went to University of Dayton and had moved here from Kentucky. Even more Americans who gave into the temptation to stay after visiting! Had a good time talking to them about their move and life in New Zealand. Eric even shared some tasty home brew cider.